And proud to call ourselves friends of the “human toothpick”, we at Anorak wonder if Nicole will manage to slide beneath the door like some Flat Stanley in lip gloss and oversized sunglasses? This is surely the green-eyed monster speaking. You can never be too thin. The aforesaid Flat Stanley is right now being repackaged in Los Angles as “Quite Plump Stanley”. It is Nicole’s friend who is disgusting, and we are appalled that someone purporting to be close to the starlet should conduct herself in so horrendous a fashion. Any more of these barbs and we fear that Nicole will become depressed, turn to eating and gorge herself on any amount of calorific lettuce leaves and portion of mung bean a la mode. For now, Nicole weighs 82lbs and stands at 5-foot-2. The Enquirer says that a person of her height should weigh 110lbs. Is Nicole “at risk of dying”? The Enquirer asks the question and seeks answers from three experts. Nutritionist and fitness expert Christine Bybee says Nicole risks malnourishment. 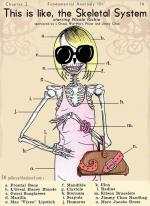 “A true anorexic looks like a walking skeleton,” says she. But “Nicole isn’t there yet”. Jessica Siegel, a “registered dietician”, says severe weight loss and malnourishment can result in “a loss of brain function”. And Dr David Martorano, director of Malibu Psychiatric Services, says people with advanced anorexia “have a significantly advanced risk of sudden death”.